Even if masses of people were to burn khadi publicly and say that it is an insane programme, I will declare that those people have gone mad. Prayer is an impossibility without a living faith in the presence of God within. Faith becomes lame, when it ventures into matters pertaining to reason! God makes crooked straight for us and sets things right when they seem to go dead wrong. God will not be God, if He allowed Himself to be the object of proof by His creatures. Prayer is no mere exercise of words or of the ears, it is no mere repetition of empty formula. The woman who knows and fulfils her duty realizes her dignified status. Non -violence is infinitely superior to violence, forgiveness is more manly than punishment. Forgiveness is the ornament. Democracy can only represent the average if not less than the average. 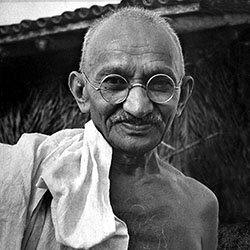 Bio: Mohandas Karamchand Gandhi was the preeminent leader of the Indian independence movement in British-ruled India.